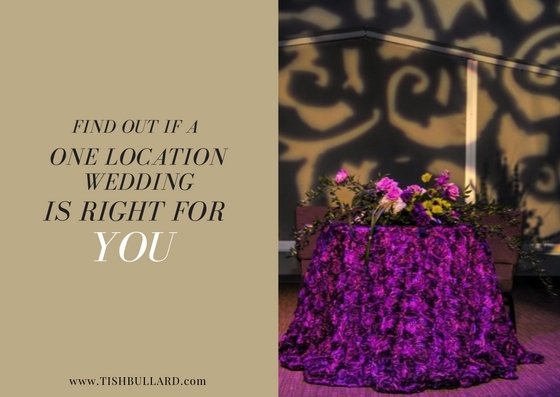 Have you found yourself wondering if one central location for your wedding ceremony and reception will be right for you? Then this post is just right for you. Traditionally, the ceremony and reception would be held in two separate locations. In many of these cases, the ceremony would be held in a place of worship and the reception at a banquet or reception facility. Today, many couples are tending to break tradition and host their ceremony and reception in the same location. Are you one of these couples? If so, one or more of the below reasons was a factor in your decision making. Getting the Wedding Party and the guests from one destination to the next in a stress free, orderly and timely manner is the goal. It takes the second guessing out of determining where the location is and getting sidetracked while in route to the 2nd location (i.e. stopping off to get a shake and fries…or worse, to change clothes). It’s easier for out of town guests to be centrally located and not have to rely on the directions from your invitations and Siri to guide them to find you. And, one location weddings minimizes the rushing and preparation of the day. With simplified scheduling, your vendors don’t have to juggle between two locations and the workflow can go more smoothly. And, overall…it’s just more convenient for you, your guests, and your vendors. With one location (venue), the overall look and style is cohesive and just works well with the feel of the occasion. The same lighting and feel will be great for pictures. And, because everything is in one location, you will cut down on your guests having the urge to leave immediately after the ceremony. With two locations, there will be two separate costs. In one location, you won’t have the hassle of trying to fully decorate two locations. In some cases, you won’t have to worry about the seating arrangements for two separate locations. Staffing and transportation costs can be cut in half with one location. Your overall costs will come down for sure. And, did we mention before how convenient one location is for everyone involved. If you are only planning on bringing on a final details coordinator for the weekend only and you do most of the planning, one location may be just what you want and need. Are you planning on having your ceremony and reception in one location? If so, tell me why you chose your venue or what you are looking in the perfect venue?